I don't think that we use enough cinnamon in savoury cooking in 'our' cuisine here in northern Europe. Other cuisines quite merrily uses it so I think we should at least try to add it a bit more often. You might have guessed it by now - today's recipe contains cinnamon. As I've stated before, I'm not a food historian so I might very well be wrong about this but to me this dish is South American in its origin. I've named it Ropa Vieja - ish since it sort of started as that dish. 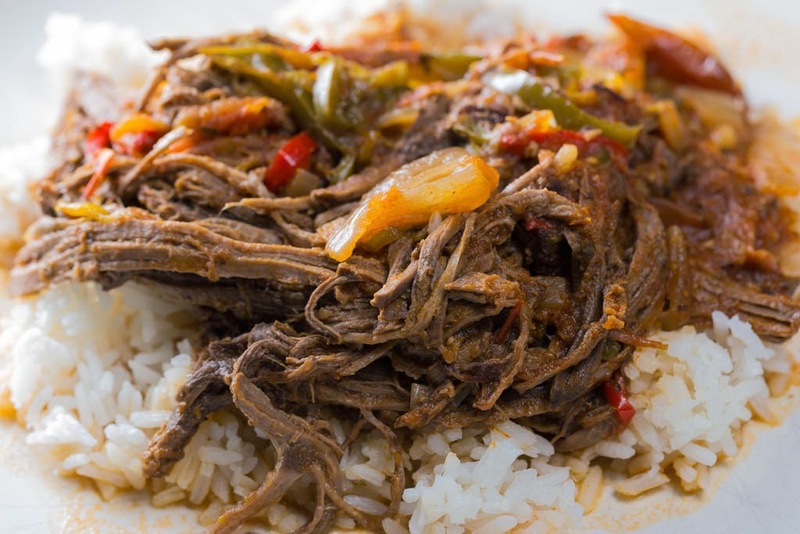 Ropa Vieja means old ropes in Spanish and you don't really have to be a rocket surgeon that it has taken its name from the stringy fibres of the meat. Once you have boiled it enough it easily shreds into those strings as you can see from the picture. This is one of those recipes, at least to my understanding, where there are umpteen variations and differences in ingredients. The basis are normally the same - beef, vegetables, liquids and spices. I've seen this served with sliced olives stirred in, capers seems to find their way in and if you want to kick it - add chillies. Quite the choice of dish for this blog - easily freestyled. I served it with rice this time, you could of course make this into the most excellent burritos if you want. Should you need to feed more people this goes well as the main protein on the plate and then you can add more fillers like refried beans, guacamole and maybe a nice pico de gallo. To keep it simple you could also just serve it in a bun with some cruncy coleslaw. Versatile. As a side note - I cut my piece of topside into two just to make sure that it cooked quicker and more thoroughly. That might be useful for you to do too. Also, I used quartered baby plum tomatoes - use whatever tomatoes, as long as they're ripe, you prefer and cut them in the way you want. Since you guys probably still are reeling from the shock of this recipe not having its roots in Sweden we'd better head over and look at how to cook this. Heat the oil in a pot large enough to house all the ingredients and brown the beef on all sides, in batches if necessary. Remove the beef and put it on a plate while you finish the rest. Add all the vegetables. tomato paste and seasonings. Keep cooking this, stirring now and then, until the vegetables start to soften. Pour in the liquids and return the beef to the pot. Put the lid on the pot and bring to a simmer. Simmer for around two and a half hours. Remove the beef from the pot and shred it using two forks. Once shredded, return to the pot and stir in well. This is when you can reduce the sauce if you feel it is too wet and this is also when you should adjust the seasoning. Hi, Mike. Looks good (even if it's not Swedish!). As far as I know, it originated in the Canary Islands and Cuba. The addition of cinnamon to the savoury dish might be explained by the Canary Islands' proximity to Morocco. This is a dish worthy of my making my homemade flour tortillas to go with it, along with some beans and rice. Must make this soon!